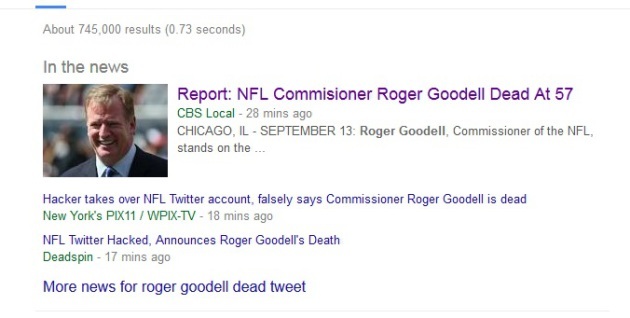 That wasn't the only rough spot for Goodell on the web Tuesday. He appeared on Monday at a golf tournament sponsored by former Buffalo Bills quarterback Jim Kelly in upstate New York, where he had his photo taken with a New England Patriots fan. We're going to spare you the photo because the fan has his right arm around Goodell -- and is giving him a middle-finger salute with his left hand. The fan, Jim Podanoffsky, found that he'd become a web sensation because of the photo and expressed his regrets to the New York Post. “It was a joke … a spur-of-the-moment thing," he said. You can read the Post story here. For his part, Goodell seemed to handle things well, at least based on this tweet Tuesday afternoon.